I had received a review copy of 'The Seeds of War' by Ashok Banker - the second book of the much awaited Mahabharata series from blogadda. 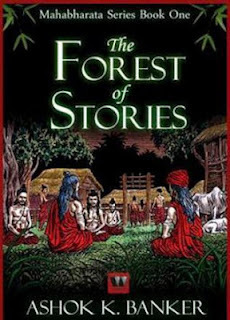 Ever since, I had read it, I had been meaning to read the first book of the series, The Forest of Stories and finally I bought myself a copy. The Forest of Stories, Book One in Ashok Banker's long-awaited 'MBA' Series, takes us deep into the haunted jungle of Naimishavan. Here, at the ashram of Kulapati Shaunaka, a dusty traveler arrives with sad tidings: Maharishi Krishna Dweipayana Vyasa has passed on. Yet the great collator of the Vedas has left behind a fabulous legacy, the epic narrative poem called Mahabharata. At the urging of the ashramites, the traveler Suta begins to recite the great composition, starting with the incredible creation myths and tales of god and giants, snake-mothers and gargantuan eagles. And as the night wears on and the tale grows darker, he senses the presence of countless ghostly beings in the shadows beyond the flickering oil-lamps, the restless souls of the many millions butchered in the climactic war that ended the great tale itself, gathering now to hear the epic saga that led eventually to their destruction and the decimation of the Kuru Bharata race. The author has tried to stick to the original ancient version of Mahabharata. How ever, as the blurb says, it is just the beginning of the narrative. Of all the mythology books I have read, I found this one a bit slow and heavy. Not that it was boring, but because as the narrator was decimating so much information in all the tales that build towards the great epic, after a while it was becoming a bit difficult to keep all the names and event in mind. It is written in the typical Banker style but, I wish the narration was a bit more coherent as my mind would often wander off and I had to re-read some parts of the book to establish the connection. How ever, it does not mean, you should not pick this book. It all depends on your level of interest in the great epic. Having read the second book of the series, I can say it only gets better. I would give it a 3/5 star.